A recent New York Times magazine article “Keep Portland Broke”, echoed a meme made popular by the satirical television show “Portlandia” asking whether the city will always be a retirement community for the young. Far from being a retirement venue for the precocious indolent, the city is in fact a beehive of social and cultural innovation and entrepreneurship. Critics are to be forgiven if they mistake a different set of interests and sometimes values for a disinterest in “traditional” work. And we’re not talking individually pedigreed free-range chickens or artisanal pickles (although you’ll find those, too). The truth is the young adults in Portland are disproportionately entrepreneurial. Among college educated 25 to 34 year olds, fully nine percent are self-employed, a rate half again greater than that of other large metropolitan areas—and ranking Portland third for self-employment among metros with a million or more population. Among the nation’s 51 largest metro areas—all those with a million or more population, Portland ranks fourth in small businesses per capita, fourth in self-employment, seventh in patents per capita and fourteenth in venture capital per capita. And true to form, the city shines when it comes to edgy and creative: according to Forbes, Portland ranked seventh in Bandcamp, third in Kickstarter, and third in Indie-Go-Go among US cities. And the city is alive with creative endeavors of all kinds. The city has more than 600 food carts and a vibrant farmer-to-family food system. The city has an unusually high concentration of musicians, artists and the creative class. Portland is home to the nation’s leading cluster of athletic and outdoor gear and apparel firms, including the world headquarters of Nike and Columbia Sportswear and the North American headquarters of adidas. And there are more than 400 other firms in the industry cluster—most of them started locally, and making Portland one of the hottest places on the planet for designers. Arts and culture. Indy bands. A prolific, inventive food scene. Strong and innovative clusters of software and semiconductor firms. A robust, world-class athletic gear and apparel cluster. And, at the end of the day, the claims of indolent retirement fall in the face of simple and compelling data about the region’s unemployment rate. In 2012, the unemployment rate for 25 to 34 year olds with a four-year degree or higher level of education in Portland was 4.8 percent—a bit higher than the average for large metropolitan areas (4.0%), but the same as Houston, and lower than Atlanta and Chicago (5.2%), Los Angeles (8.3%) Las Vegas (7.2%) and—attention New York Times—New York (5.7%). This new generation is doing new and different things. It is keeping Portland weird. And some of what is happening will seem bizarre or disconcerting to those who’ve grown settled in their ways. But Oregonians are pretty much oblivious to this kind of derision from outsiders: we’re content to do what we want because it makes sense to us, not because it passes muster with critics from somewhere else. There’s actually a long history of that here in Portland. Back in the 1960s, at a time when adult Americans generally didn’t sweat in public if they could avoid it, people in this area started running and jogging for health. What was originally odd behavior—grown men and women in shorts and t-shirts out running along public streets—presaged a national and global trend in fitness. And one guy started a business selling Japanese sneakers to these joggers out of the back of his 1964 Plymouth Valiant station wagon. The company Phil Knight started—Nike–is today one of the world’s most recognized brands and the global leader in sports apparel. Not every weird little habit ultimately leads a Fortune 500 company, but a surprising number of successes emerge people were weren’t afraid to be different. Joe Cortright’s earlier rejoinder to the New York Times article on Portland appears on CityLab. We’ve chronicled the rapid increase in the number of well-educated young adults living in Portland’s close-in urban neighborhoods over the past two decades. The large and growing workforce in the urban center is having a significant economic impact–firms are increasingly choosing to locate and expand in the downtown area and nearby neighborhoods to hire these workers. A new report from the Oregon Employment Department’s Christian Kaylor highlights two striking developments. First, job growth in the City of Portland is sharply outpacing that of the surrounding suburban counties. Over the past year, employment growth in Multnomah County–which is mostly the City of Portland–has been 2.4%, more than double the growth rate in the two adjacent suburban counties (Clackamas – 0.9% and Washington 1.0%). This represents a reversal of this historic pattern of job decentralization. Second, worker incomes in Portland have grown rapidly in the recovery, while they have been stagnant in the suburbs. 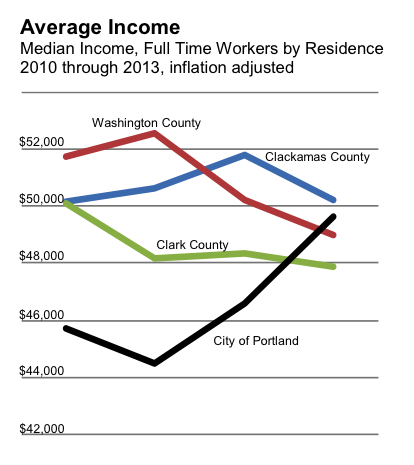 Using data from the latest American Community Survey, Kaylor estimates that median incomes, adjusted for inflation, for full-time workers living in Portland have grown from $45,000 to $49,000 since 2010. They’ve surpassed earnings for two of the three surrounding suburbs.